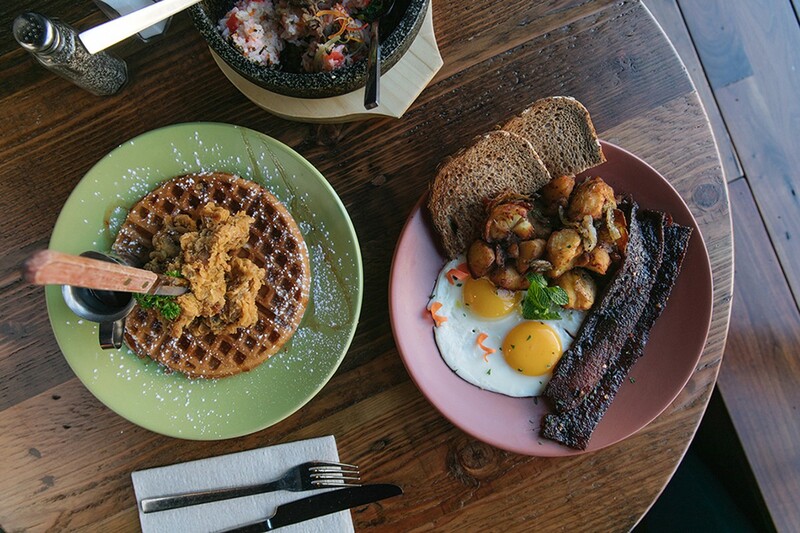 Breakfast at Berkeley Social Club might include an egg plate with "Millionaire's Bacon" (right) or a Korean spin on chicken and waffles. Hours: Mon.–Fri. 8 a.m.–2:30 p.m., Sat.–Sun. 8 a.m.–3 p.m., Sun.–Thu. 5–10 p.m., Fri.–Sat. 5–10:30 p.m. The name "Berkeley Social Club" doesn't exactly scream "Korean restaurant." Then again, the last thing the two-month-old downtown Berkeley eatery aspires to be is traditional. 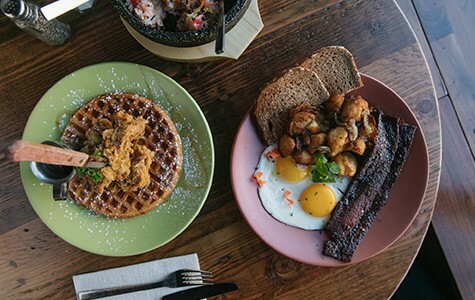 Located in the gigantic former Perdition Smokehouse space, the restaurant is the brainchild of co-owner Steven Choi, who has seven other restaurants in the Bay Area, many of which are known for their Korean-inspired breakfast dishes and, specifically, something called "Millionaire's Bacon." The East Bay has enviable supply of Korean mom-and-pop restaurants, but Korean-American fusion cuisine has not really taken off — the propensity of certain (mostly non-Korean) chefs to throw rice and vegetables in a bowl and call it "bibimbap" notwithstanding. Anyway, if this is a food genre that interests you, you could do a lot worse than brunch at Berkeley Social Club. Many diners will probably home in on the "Waffle and KFC," which combines two foods that are much beloved by dining-trend prognosticators in 2017: Korean fried chicken and riffs on Southern-style fried chicken and waffles. In this version, the waffle was just an ordinary waffle, so the star of the dish was Korean-born executive chef Nick Yoon's take on "KFC," which was non-traditional insofar as it was made with boneless skinless thighs. Even without the skin, the KFC style's characteristic double-frying technique yielded juicy flesh and a shatteringly crisp crust. Berkeley Social Club makes two versions of the chicken — one that's tossed in spicy-sweet sauce, and a (superior) "dry" version, which is what they use for the chicken-and-waffle dish. My only quibble was with the accompanying syrup, which was unpleasantly savory from having been spiked with some gochujang (Korean pepper paste) based sauce. Another dish that the restaurant has lightly reinvented is the pajun (or pajeon) pancake, a take on the kind of scallion pancake that most Korean restaurants serve. Here, the pajun is studded with bacon and topped with a runny-yolked poached egg, in order to turn it into a breakfast dish. The pancake itself was delicious, if somewhat flaccid. I'd have appreciated a bit more crunch. And I'll cop to feeling skeptical toward any dish with a gimmicky trademarked name like the aforementioned Millionaire's Bacon. Choi explained that he came up with the recipe at Sweet Maple, one of his San Francisco restaurants, after encountering a similar bacon preparation in Mendocino County. To make Millionaire's Bacon, he coats thick-cut bacon with cayenne pepper and a ton of brown sugar, and then bakes it low-and-slow in a convection oven for many hours. The end result resembles a crunchy, sweet-and-spicy jerky — quite tasty, if not substantively different from other candied bacons. (Oakland's Pican, for instance, makes a Creole-inspired version that's also very good.) At $6 for a two-slice breakfast/brunch side order, the bacon isn't so extravagantly priced that Cal students can't splurge on it every now and again, even if they aren't millionaires. There was nothing particularly Korean about that bacon, of course — or several of the restaurant's other fairly straightforward American breakfast dishes. This is the kind of brunch spot where you can order a bugolgi scramble if the mood suits you, or plain old buttermilk pancakes or an egg-and-cheese breakfast sandwich if you prefer. Other items were purely Korean: the misugaru latte (a frothy multigrain beverage that tastes similar to lightly sweetened cereal milk), for instance, or the "Boosted Jook," which was a modern, runny-egg-topped version of a kind of Korean rice porridge that often serves as a bland accompaniment to more flavorful side dishes. Yoon's version was delicious all on its own — luxuriously thick and amped up with bits of bacon and tangy-hot pickled cherry pepper. The morning menu alone makes Berkeley Social Club a welcome addition to a landscape sorely lacking in full-service restaurants that serve breakfast seven days a week — especially since it diverges, at least in part, from the standard American eggs-and-hash-browns formula. Dinner, on the other hand, is made up of what Choi describes as "modern Korean" cuisine, similar to what you might find at upscale restaurants in Seoul, where Yoon cut his culinary teeth. The dinner menu consists entirely of Yoon's creations, though another chef, Ike Hwang, has since taken over day-to-day kitchen duties, freeing up Yoon to helm Surisan (another Choi-owned restaurant in San Francisco). Even just six weeks after Berkeley Social Club opened, brunch already felt like a finely honed affair — benefitting, perhaps, from the fact that many dishes are carryovers from Choi's other restaurants. Dinner, on the other hand, was still a work in progress. No dish better illustrated the restaurant's shortcomings, as well as its potential, as the Bang Bomb, which turned out to be my favorite dinner entrée. It was, for starters, a striking-looking, Instagram-ready dish that's meant to elicit oohs and ahs: a giant, hand-molded ball of rice that arrived at the table covered in dark seaweed, so that it resembled a blackened, prehistoric egg. 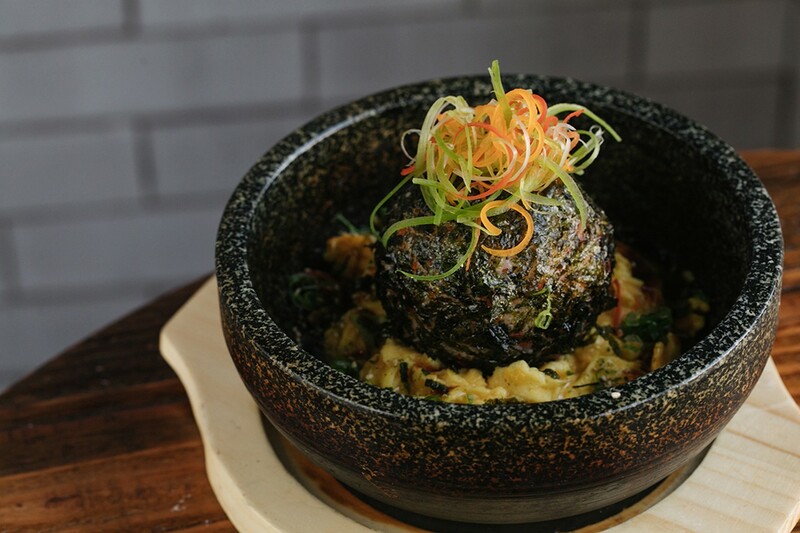 The Bang Bomb sat in one of those hot stone bowls that Korean restaurants use for dolsot bibimbap, atop a layer of tender, burbling steamed egg. After we smashed the ball with our spoons, as our server instructed us to do, we found more surprises inside: bugolgi (sweet marinated beef) and tiny balls of fish roe, whose salty little bursts were my favorite part of the dish. It's a whimsical, inspired feat of cooking that brings together at least three different Korean dishes: kimbap (aka Korean sushi), bibimbap, and Korean-style steamed egg. But once you mix it all together, you wind up with what is essentially a glorified rice bowl. As part of the same meal, we also ordered the Club Moco, which was a kimchi-laced version of Hawaiian "loco moco" — basically a rice plate topped with a beef patty, a fried egg, and a thick mushroom gravy. The "G.I. Fried Rice," on the other hand, was a straight-ahead version of Spam-and-kimchi fried rice. Both were competently executed, if somewhat boring, entrées. And the upshot was that we'd accidentally ordered an entire dinner that was off-puttingly rice-heavy, which is one of the potential pitfalls of dining family-style here. Beer nerds will be happy to hear that the forty taps from the restaurant's Perdition Smokehouse days are alive and well — but perhaps disappointed to find a list dominated by the usual suspects: the Lagunitas and Ballast Points of the world. Ultimately, Berkeley Social Club feels like a restaurant that still needs to figure out who its core audience is. After all, the space is huge, and there are an awful lot of seats to fill if the business is to be financially viable — about 190 seats between the dining room and the back patio, Choi said. Still, he dismissed any concerns about the location's recent history, citing his own record of turning around locations with reputations for being "challenging." As for the size of the space, Choi believes that's more of a blessing than a curse: Already, he said, the restaurant is one of the few places in town where a young family can walk in during peak brunch hours and not have to worry about there not being enough room for the kids to run around. And he's got big plans for that outdoor patio, too, once the weather warms up: nightly movie screenings like the ones Foreign Cinema is known for in San Francisco.